.As a sophisticated world traveler, I have eaten in restaurants in over 112 different countries. Not only have I indulged in the domestic cuisine of my host nations, I have always searched out the best cheeseburgers in those regions. The variations of our national food have ranged from tube shaped spicy ground beef wrapped in an Arabic flat bread in Libya to a two pound, chopped steak smothered in a rich beef gravy and placed in between a crusty sweet roll in Argentina. But one of the best was found in a small street cafe in Louangphrabang Loas. It was a small wooden framed building with a half a dozen small tables and a clean cement floor. No one spoke English, but after a some grunts, laughter and pointing to a handwritten drawn pictures on some notebook paper, Chef Lu prepared a cheeseburger and fries that would bow the heads of most American fast food cooks in embarrassed shame. Laos is a very beautiful but poor country. Chef Lu can't run over to the local Safeway and purchase frozen patties, fries and a bag full of Wonder, vitamin enriched buns. Ground beef is difficult to obtain and usually very poor quality. But Chef Lu seasoned that burger inside and out to bring out and enhance the washed out flavors in his old ground water buffalo. His tomatoes, lettuce and onions were grown behind his family's home, and the cheese was made by his wife using a recipe her mother used during the French occupation. The bun was baked early in the morning, and the potatoes were cut and fried seconds after the order was placed. Chef Lu had never tasted a McDonalds thirty-nine cent cheeseburger or a bag of frozen fries. He may be poor with capital investments but far richer than most Americans with his culinary experiences. At Willies, Dr. Meat and I ordered their 1/2 pound Cheesy Bad Boy. The patty was even more impressive than what Chef Lu served to me on that hot August afternoon. It was charbroiled with a natural smoke flavor, dripping in juices and cooked slightly dry on its outer, thin edges. Atop that beef was piled grilled, red onions covered by a thick slab of melted, rich cheddar cheese. The condiments were also first class -- big beef steak tomatoes, whole leaf iceberg lettuce and a tangy orange sauce that Dr. Meat licked up off the table and his pants when several drops fell from his burger. The bun, however, was one of the worst we have ever tasted. It was an airy, cheap imitation of the standard Wonder-type-bun. It dissolved like wet cotton candy and failed to match their awesome patty. The fries were frozen and similar to the tasteless spuds found at McDonalds. 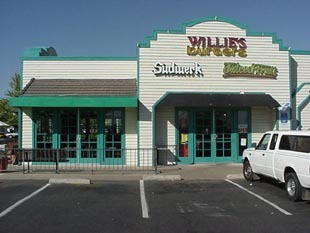 Willies has the potential to be one of Sacramento's finest dining establishments. It is one of my favorite places to snack on some roasted garlic and brie on a rainy day or have a cool salad on one of our fiery hot summer afternoons. This restaurant, however, stops just short of moving up by cutting cost on cheap bread and failing to understand the importance of using fresh potatoes for their fries. Dear readers I must apologize for the tardiness of this review. Unlike my puffed up, pompous, quick to judge colleague I felt I could not fairly review a Willie's without a second shot. Yes, for you dear reader I went back to this store and sampled their "Cheesy Bad Boy" for the second time in four days. There were too many questions, too many stones unturned, and we showed up to the Folsom store on an empty stomach. In the interest of fairness I had to go back, I mean what kind of dedicated burger professional reviews a meal with nagging doubts in his/her head? Willies is supposed to be an urban eatery (kind of out of place in Folsom), with the large tile floor, corrugated and galvanized sheet metal walls, and paper towel dispensers as napkin holders; they almost pull it off (I was fond of the classy "Go Here 2 P" neon sign pointing the way to the facilities). A patron orders at the sheet metal counter off of the huge menu/billboard. They have quite an array of burgers that range from the afore mentioned "Bad Boy", to the "Slammers", and "Hammers" (if you have to ask, you have to go). They also have a full Coke product fountain, Sudwerk Beer (for the parent readers of course), and a host of bottled soft drinks and fermented beverages. I feel the need to editorialize for just a bit, alcohol and burgers do not mix! I can understand a shake, iced tea, and of course all Coke products. As my esteemed partner can attest to from his many AA meetings, drinking and chewing don't mix! Just say no! The burger was a visual work of art. Everything piled high and in proper proportions. I was particularly enamored with a certain slice, no slab of tomato. It was a full centimeter thick and it tasted like the vine ripened variety. The lettuce was whole leaf, they had an actual secret sauce, real flavorful cheddar, and (I was not impressed, give them to me raw and sweet) grilled onions. All this sounds like a winner to the uneducated ear, but let me school you. The bun was a wonder bun, flat and useless. It actually mushed up and melted into the patty from the juices dripping from the center of this 1/2 pound slab of "Bessie"! So I went back for a second burger four days later, all the afore mentioned data were true for the second time except it was the driest patty I ever ate! I had juicier beef jerky than the patty I had the other day. The patty resembled a fried egg, one that was fried in browned butter. The edges all lacey and dirty snow flake-like! I swear dear reader it actually crunched! To compound the dryness of the second trip I ordered my "CheesyBadboy" with a sourdough bun. I thought it would hold up to the ruthless assault mounted on the wonder bun from my previous experience with the expertly cooked juicy patty. Was I ever wrong. I had to dip the burger in catsup so I could swallow without choking to death. I think they ought to rename the burger "Desert Storm", "Phoenix Summer", or "My Trip to Barstow".